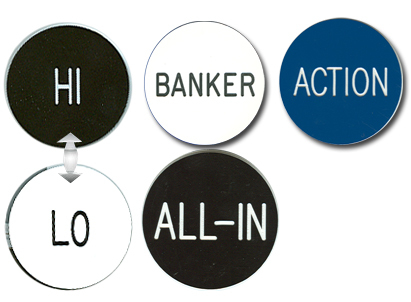 These 1-1/4" plastic Lammer Buttons are the same ones used at casino gaming tables. 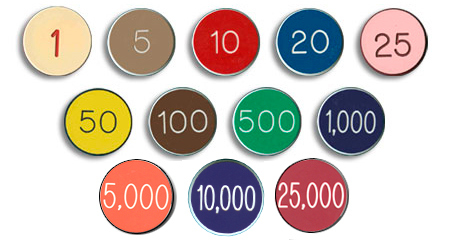 You can choose from nearly three dozen different Poker, Craps, and Baccarat Buttons, including Buy-Lay Buttons, On-Off Buttons, Big Blind Buttons, Kill Buttons, Numbered Buttons, and more. Marker Racks for Lammers are also available in 5 capacities. If you are interested in lammers that you do not see here, please feel free to contact us at 1-800-233-0828 to see if we carry your item. Hold Button, Absent Button, Reserved Button, Locked Button, Banker Button, Co-Banker Button, Envy, and 3rd Man Walking. On-Off Button, High-Low Button, Buy-Lay Button, Little Blind Button, Big Blind Button, and Kill/Half Kill Button. This Seat Change Button features an overall yellow color with a black imprint and measures 1-1/2" in diameter. These plastic buttons are 2" wide x 3/4" high. 2" Bank and 2" Player Buttons are available. Please feel free to browse our selection of Craps, Poker, and Baccarat Supplies. Or, contact us at 1-800-233-0828 for a FREE 104 Page Casino / Gaming Supplies Catalog.